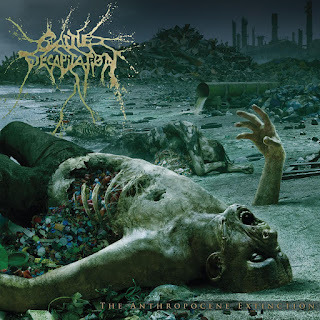 "Streamlined" (predictable, familiar, and sticks within boundaries) is the initial thought that entered my mind when spinning Cattle Decapitation's newest effort for the first time. Monolith of Inhumanity felt jumbled in comparison, willing to branch off into weird directions, and pounce on every available opportunity to experiment, but thinking back on it, that's what that record was aiming for--a stylistic shift. Comparatively, The Anthropocene Extinction repurposes the sound, sugar coats it, and makes it accessible insofar as extreme metal can be, meaning the music simultaneously beats you up and keeps you coming back for more. But is it above Monolith of Inhumanity, a record destined to become a modern classic? Indeed, both albums share more similarities than differences. The two are based on the same template, after all, and incorporate Ryan's first forays into cleaner vocals, giving the music massive hooks. 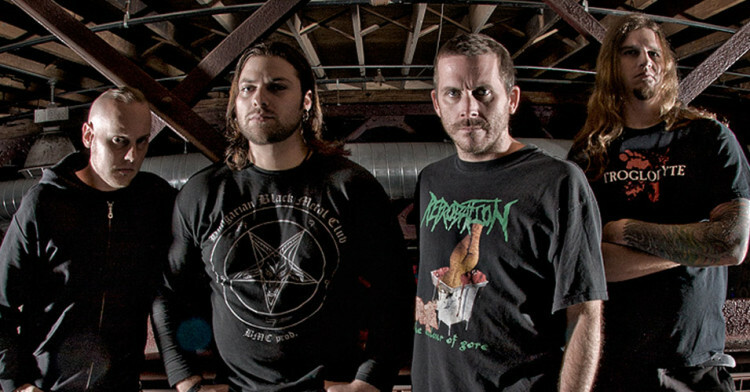 Where they differ, however, is songwriting: yes, the riffs are similar; yes, the core concept is very much alike; and, yes, it's unquestionably Cattle Decapitation--the flow, atmosphere, and structuring is simply different. Especially noticeable about The Anthropocene Extinction is the overabundance of cleaner vocals, which can make or break the music. Poring over discussion at Metal Archives, fans either seem to love or hate the shift--many choruses are layered with Ryan's melodic half-harsh, half-clean crooning, lending to the overall accessibility of the package. In the end, the music isn't the only thing streamlined--so are the vocals. And, frankly, they're the most obvious difference in songwriting past the fact that the music offers refuge for those looking for few surprises. One would be forgiven, though, for wondering if the entirety of album sounds the same because of the shift. Thankfully, that isn't the case--each song has a distinct, recognizable personality with a mixture of riffs pulled from various sects of metal, melodic guitar solos, and unmistakable vocals. 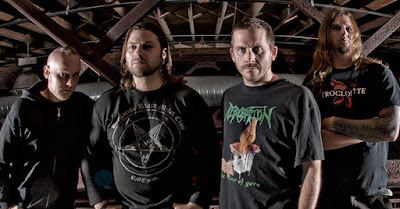 While it's true that the roster sits closer together and lacks some of the exciting spontaneity that gave Monolith of Inhumanity charm, that isn't necessarily a bad thing because a comfortable band is a consistent band. And, depending on one's preferences, that may give The Anthropocene Extinction the upper hand over Monolith of Inhumanity. Picking the superior record ultimately depends on one's personal preferences, whether it be with ease of entry, a drive to explore the most obscure nooks and crannies of metal music, or even a mixture of the two--The Anthropocene Extinction plays it safe, while Monolith of Inhumanity embarks on an eternal quest for an experimental identity. Either way, both are superb chapters for Cattle Decapitation and showcase a rapidly maturing band. If the four-piece maintains the same level of quality for future full-lengths, their spotty, though well-meaning, past may very well be forgotten. And for the better.